The United States of America considers military presence around the world as one of the key tools for ensuring national interests. The Pentagon has a huge amount of military bases and various facilities outside the national territory in more than 30 countries. Besides, US military instructors carry out training missions for local armed units of dozens of foreign states while the US special operations forces operate in more than 80 countries. The maintenance and expansion of the military facilities network as well as conducting operations abroad in 2018 will cost the US taxpayer $89 billion — that is $23.2 billion more than the year before. However, financing a global military presence isn’t the main challenge the US Department of Defense is facing. A much more complicated task is to bring the foreign units to strength with physically and mentally healthy personnel, as by September 2018 the Pentagon needs to enlist over 80,000 volunteers. Meanwhile, last year’s bar of 69,000 recruits was achieved with great difficulty. After the tragic events of September 11, 2001, in New York, the American nation was ready to support any anti-terrorist initiative of the White House. Young people actively joined the ranks of the Armed Forces being ready to go to the Middle East and Central Asia to take revenge on extremists for the supposed attack. Moreover, as the New York Times has noted since 2002, young people from the well of American society have joined the military service. They had high school degrees more often and scored higher on qualification tests compared with the period before “9/11.” The situation dramatically changed in 2005 when the bodies of American soldiers began to arrive from Iraq. At this time, the Pentagon had to face a massive shortage of volunteers and a reduction in their quality and only the 2008 financial crisis forced the Americans who lost their source of income to flee from poverty and hunger into the Armed Forces. Nowadays, Americans do not feel an imminent threat. In these conditions, the Pentagon has fewer arguments to attract new recruits. Potential soldiers fear the prospect of an infamous death in Iraq, Syria, Afghanistan or some unknown African or Latin American village. This situation forces the Pentagon to resort to various tricks. According to USA Today newspaper, starting August 2017 people with a history of “self-mutilation,” bipolar disorder, depression and drug and alcohol abuse are able to join the Army. Journalists from Newsweek indicate serious physical health problems among the recruits especially from Southern states. A significant number of candidates are obese and unable to undergo a basic physical training course. All this inevitably leads to deterioration in the combat training of personnel and reduction in the fighting capacity of troops as well as growth in crime among servicemen, and most importantly, it increases casualty rates in combat missions, special operations, and daily activities. Military Times reported that in 2017 the number of servicemen killed overseas has increased for the first time in six years. According to the DoD official data, the death toll increased from 26 to 31 servicemen, not including 17 sailors killed in two separate ship collisions. It is quite obvious that in these conditions Washington is not interested in revealing losses among American servicemen and Defense Department contractors to the general public, especially in the US. That is why the military leadership uses a whole range of administrative and legal measures. For the high-risk missions, the DoD tends to hire private military companies (PMCs) or deploy units formed mostly of non-citizens. Formally the Pentagon has the right not to include casualties among the foreigners and PMC members into official statistics. It also produces a feeling that American soldiers are safe and sound while only some abstract mercenaries die in war zones. According to researchers from George Washington University, between 2001-2010 5,531 US troops and 2,008 PMC contractors were killed and 16,210 and 44,152 wounded in combat operations in Afghanistan and Iraq. So the total number of US casualties exceeded 7,500 while an incredible figure of 60,362 represents the final injuries count. A common practice is the concealment of losses. The DoD representatives usually come out with an official statement after the information has already become available to the general public via social networks, monitoring organizations or the mass media. In this case, it is worth mentioning that recently there has been a tendency for intervention in the work of independent observers. In 2015 an international security specialist and a former Guardian writer Nafeez Ahmed published an investigative report in which he reveals that an allegedly independent anti-war monitoring group Iraq Body Count is largely funded by the US administration and DoD contractors. While by the end of 2017 The Daily Caller and some other news outlets reported that the Pentagon imposed a restriction on public release of information about U.S. war efforts in Afghanistan. Only three months later DoDadmitted that it was a mistake blaming “human error” for the order. The attempt to limit public access to the Afghan operation comes as a result of a very limited success in this country. Furthermore, American citizens continue to die there. 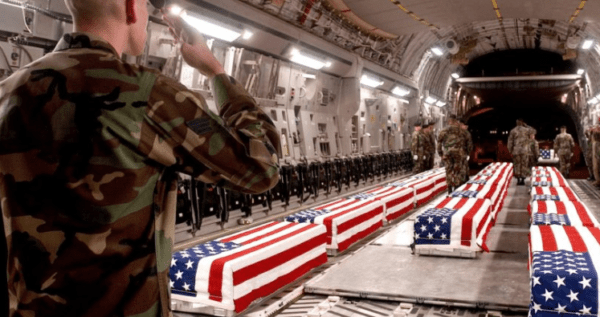 According to official statistics since the start of Operation Freedom’s Sentinel (January 1, 2015 – present days) the US Armed Forces had 47 military casualties. Meanwhile, according to iCasualties, 51 American servicemen were killed in Afghanistan during the same period of time. As a rule, the reason for official recognition of losses by the Pentagon is the “leakage” of information about the incident into the mass media. For example, DoD officially confirmed the death of Army Sgt. 1st Class Mihail Golin in the Afghan province of Nangarhar on January 3, a day after Stars and Stripes wrote about it. He was killed on January 1. To a certain extent, the habit of concealing the casualties until the last moment is in some kind of an indicator that any nameless dead American outside the country is in one way or another related to the Defense Department. At least such a conclusion appeals to the US citizens who were killed during the terrorist attack on the Intercontinental Hotel in Kabul, Afghanistan. One of the victims was Glenn Selig, spokesman for Trump campaign adviser Rick Gates. This information was provided by a representative of the Selig Multimedia company founded by Glenn. The identities of other Americans are carefully concealed under the pretext of “respect for the feelings of the families of the dead.” Taking into consideration that Selig was a high-rank official the remaining three could well be SOF operatives, DIA officers or even CIA agents. When the fact of death can’t be kept off the records, DoD officials often resort to methods of direct data manipulation. In particular, non-combat casualties can be excluded from the general casualties list. For this purpose even if the accident occurred during the combat mission it is often categorized as non-combat until the end of the investigation which can last more than a year. Disclosure of the information about American citizens killed overseas carries another threat to the Pentagon – the disclosure of the US military activity in the regions where the operations with their participation aren’t officially conducted or the stated goals don’t coincide with the real ones. “Since 1952, we’ve been conducting missions unknown to the general public and, sometimes, to the conventional forces,” said retired Maj. Gen. Simeon Trombitas, chairman of the Green Beret Foundation. Most likely during one of these “unknown” operations on October 4, 2017, four US Army Special Forces Troops were killed in an ambush near the settlement of Tongo Tongo, Republic of the Niger. The first mass media reports on the day of the incident stated three Green Berets were killed two were wounded in the course of a routine joint training mission with Nigerian forces. Two days later the body of the fourth soldier was found and Reuters’ anonymous source reported on a possible connection of the attackers with the Islamic State. It took the US president Donald Trump 12 days to comment on the incident and immediately got him in the center of a scandal being accused of a disrespectful attitude towards the family of the killed serviceman. Despite this grand fiasco, the focus of media attention quickly shifted back to the incident itself. It was due to the release of an IS propaganda video based on one of the Green Berets helmet camera footage. In the public, expert and political circles of the United States intense debates arose about the nature and the scope of American intervention in Africa. As a result, some press outlets acquired information that the Special Forces unit carried out a task of hunting down one of the local IS leaders Doundou Chefou. Besides, it turned out that the mission in Niger which became a surprise for the majority of American political establishment is a part of the Pentagon’s large-scale anti-terrorist campaign on the African continent. Within its framework, US military forces are deployed in Chad, Somalia, Libya, Cameroon and several other African countries. Disguising clandestine operations as training missions is one of Washington’s favorite methods but not the only one. In order to avoid direct accusations of espionage and interference in the internal affairs and other unlawful activities in other countries, the US intelligence agents use non-governmental and non-commercial organizations as a cover. On December 20, 2015, a US citizen Liza Akbari was killed in Afghanistan’s capital. According to the official data from the State Department, she was an employee of the aid agency World Vision and a USAID contractor. It is worth mentioning that Israel accused the employees of this NGO of espionage and sabotage activities and cooperation with the Palestinian Hamas group. Besides, the assassination of Akbari became the fourth case of an attack on World Vision members since 2010. Another evidence that suggests that the death of a US citizen was not an incident became a report by the head of the Kabul Police investigation department who had claimed the murder was planned and committed using a silenced weapon. Many questions had been raised regarding the U.S. military helicopter crash in the west of Iraq on March 15, 2018. The news first appeared in Iraqi twitter accounts around 2 p.m. local time. They reported an accident involving transport helicopter CH-47 Chinook. The Pentagon’s first unofficial comments followed on the same day. It was clarified that the aircraft involved was an HH-60 Pave Hawk that went down near the Iraqi city of Al-Qaim located near the Syrian border. It was stressed that the crew carried out a non-combat mission and but was ferrying troops. On March 16, the DoD officials confirmed the death of all seven crew members. They also added that the crash did not appear to be the result of enemy activity. Since the true reasons of the disaster are still the subject of an investigation the press considers the versions of the pilot’s error, malfunction and a collision with power lines. However, considering the fact that two HH-60 Pave Hawk participated in this mission, it’s unclear why the crew of the second aircraft was unable to name the cause of the crash. Moreover, the social media, USA Today newspaper and the official operation Inherent Resolve new release all show a different time of the accident. And finally, using an expensive HH-60G Pave Hawk helicopter for a simple transfer of personnel looks incredible. This combat search and rescue (CSAR) helicopters with fire support capabilities and advanced avionics equipment are used to deliver small commando units to the operation site. The number of the troops onboard, four crew members and three passengers, also suggest that this was unlikely a routine transport mission. If the helicopters did participate in the special operation the flight was likely to be in the radio silence mode and this explains the difficulty in finding out the cause of the crash. In conclusion, we can state that the White House intends to increase the scale of interference in the internal affairs of independent states around the world. However, Washington is finding it increasingly difficult to use the right tools for implementing this strategy, as it struggles to find enough human resources of acceptable quality to enhance U.S. military global presence. Lessons of history has taught us that the problem of involving mentally and physically healthy recruits can be solved either by external aggression or global financial collapse. Otherwise, the US overseas casualty rates are only going to rise. And concealing this information in the era of “Jihady Hollywood” is next to impossible.